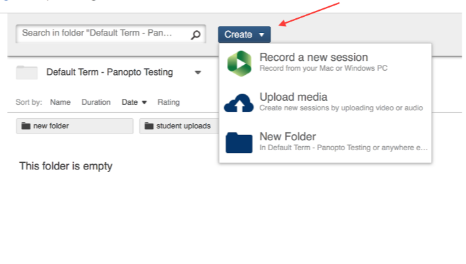 Canvas @ YaleInstructor Guides Media LibraryHow do I add media files to the media library? The Media Library is the place to upload any video or audio files you'd like for sharing with class participants. All basic functions can be found through the “create” button” in the Media Library tool. The create button can be found in the top center of the Media library page. To upload video and/or audio files select “upload media” from the create button. You can drag and drop up to 100 files into the window. After uploading has finished you may close the window. Once processed, they will be viewable by students. This option will download and open the screen and video recorder. Please click here for a guide on using this recorder. Simply click on “Create” then “New Folder” to make a new folder. Creating folders is a useful way to organize your media. You may create as many folders and subfolders as you like. Prev: What is the Media Library tool? Next: How do I create a video assignment?